A Crew Exploration Vehicle (CEV) launches atop an Ares rocket in this illustration. Thirty-sevenyears ago today, ProjectApollo put the first humans on the surface of the Moon. The next time theU.S. launches its astronauts to Earth's natural satellite, they will do so aspart of Project Orion, collectSPACE.com has learned. NASAintends to use the moniker Orion as both the title for its next generationmanned craft, the Crew Exploration Vehicle (CEV), and as the project's name.This approach is modeled after the 1960's program when Apollo Command Moduleslaunched astronauts under Project Apollo. UnderProject Orion, NASA would launch crews of four astronauts aboard Orion capsules,first to Earth orbit and the International Space Station and then later to theMoon. Two teams,one led by Lockheed Martin and the other a joint effort by Northrop Grumman andThe Boeing Co., are currentlycompeting to build the CEV. NASA is expected to select the winner inSeptember. 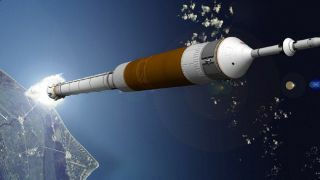 In June,NASA announcedthat its crewlaunch vehicle, which would lift the CEV into space, would be named Ares 1,with Ares 5 reserved for a larger booster to haul cargo or a futureMoon lander. At the time,NASA's Associate Administrator for Exploration Scott Horowitz said that thereason he wasn't also releasing the name of the CEV at the same time had to dowith the legal process related to federal trademarks. "Wehave to make sure we aren't infringing on any copyrights or anything,"Horowitz said, describing how Ares was selected. "You have to go throughthat whole process and that just takes time." At the sameJune 30th press conference, Constellation program director Jeff Hanley saidthat the name for the CEV was close to being finalized. "Weare trading three or four names at this point. There is a running, leadingcandidate that of course, I can't talk about yet because we have to go througha process to have it vetted and approved. Hopefully, I'd like to think that ina month we'd be able to role that out," said Hanley. NASAspokesperson Dolores Beasley told collectSPACE, a SPACE.compartner, today that NASA did not have a name for the CEV at this time. Yet apublicly-accessible federal trademark search shows that NASA was granted theuse of Orion on July 14, 2006 for use with "command modules" and"crew capsules", as well as crew and cargo launch vehicles. Sourcesclose to the agency confirmed to collectSPACE that the name Orion was inthe final stages of approval. Earlierdocuments obtained in January by collectSPACE used the names Antares andArtemis as 'notional' titles for the CEV. Orion will soon officially replacethose other names for internal and external use, though when NASA will announceOrion is not yet known. In additionto its association with Greek mythology, which includes tales of Apollo andArtemis, Orionis also one of the most recognizable constellations in the night sky, that ofthe embattled hunter. Project Orion was also the title given to a 1960s projectto design a nuclearpulse-driven spacecraft.